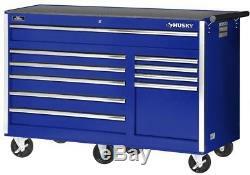 Husky Roller Cabinet Tool Chest 56 in. 10-Drawer Ball Bearing Slides Blue. 10-Drawer Roller Cabinet Tool Chest in Blue is the storage solution you've been looking for. Featuring a portable design, it can be moved around for ultimate customization. Ideal for your home or garage, it is built with an 18-Gauge double-wall steel construction to handle heavy usage. This Husky tool storage system features a high-gloss powder coated finish, designed to increase resistance to corrosion, weather and staining. It has 10 drawers - four small, five medium and one large and features a total holding capacity of 22,788 cu. Providing plenty of storage for all your hardware. Designed to accommodate heavy loads, it has ball bearing slides that can hold up to 100 lbs. So you can easily access anything stored inside. This tool storage system has a keyed lock to offer you peace of mind. 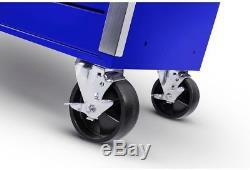 With fixed and swivel casters, it allows you to easily move the unit around your workspace. 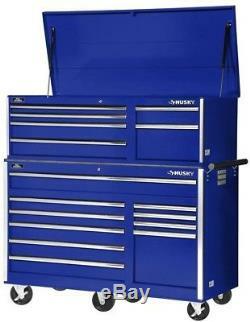 Keep your workshop and garage neat and organized with the Husky 56 in. 10-Drawer Roller Cabinet Tool Chest in Blue. D; left bank: 2-drawers: 33-5/8 in. D; right bank: 3-drawers: 15-3/4 in. Ball bearing slides with a weight capacity of 100 lbs. Fully extendable drawers provide easy access to tools and equipment. Features an 18-Gauge steel construction for increased durability. Worktop provides an ideal spot to focus on projects. Casters, so you can easily move the unit around. Keyed lock designed for securing your equipment. Roller cabinet can support up to 1,000 lbs. Drawer glide weight capacity of 100 lbs. Nominal Width: 56 Product Depth in. : 24.50 Product Height in. : 38.13 Product Width in. : 100 Features: Ball Bearing Slides Frame Steel Gauge: 18 Grade: Heavy Duty Holding Capacity cu in. 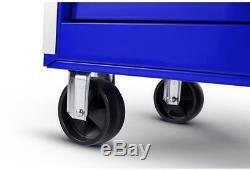 : 22788 Included: Wheels Material: Steel Number of Drawers: 10 Product Weight lb. : 264lb Returnable: 30-Day Tool Chest Size: Large Tool Storage Product Type: Tool Chest Tools Product Type: Tool Storage Weight Capacity lb. We do not accept P.
These products are manufactured according to the specifications of the US Electrical Standards and codes. We assume no responsibility if the item malfunctions or causes an accident because you tried to use the product with foreign electrical standards. The Use with a converter or other voltage transforming device is at your own Risk. Please Note: Products are designed and rated for use in the US using 120 volt current. With or without a transformer, this product is not recommended for use outside the US. We guarantee that your issue will be solved quickly. I&###xA0;usually respond within 12&###xA0;hours or less. D ---Ball bearing slides with a weight capacity of 100 lbs. --Fully extendable drawers provide easy access to tools and equipment ---Features an 18-Gauge steel construction for increased durability ---Worktop provides an ideal spot to focus on projects ---Has 6 in. Casters, so you can easily move the unit around ---Keyed lock designed for securing your equipment ---Provides 22,788 cu. Of total storage capacity ---Roller cabinet can support up to 1,000 lbs. 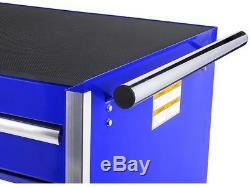 --Drawer glide weight capacity of 100 lbs. The item "Husky Roller Cabinet Tool Chest 56 in. 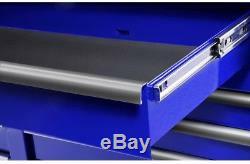 10-Drawer Ball Bearing Slides Blue" is in sale since Friday, June 22, 2018. This item is in the category "Home & Garden\Tools & Workshop Equipment\Tool Boxes & Storage\Tool Boxes". The seller is "beyondhomeimprvmt" and is located in Multiple Locations. This item can be shipped to United States.